Congratulations Monica! Monica has received the Top Women in Finance award—for the second time! 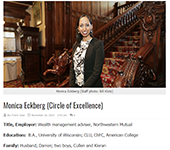 She first received the award in 2013 and this year Monica was named to the prestigious Circle of Excellence, which recognizes women who have been selected for the award twice. As a Northwestern Mutual Wealth Management Advisor, Monica and her team have a strong commitment to providing clients with the ability to align where they are with where they want to be in the future. They strive to mitigate risk and optimize resources for families and businesses in a way that stays true to their values. They are dedicated to providing clients with a comprehensive and personalized Wealth Management Experience. Monica's approach to financial advice is rooted in an expansive knowledge and experience within the field, as well as a belief in a personal relationship with each of her clients. Financial security is developed through hard work, discipline and smart financial planning. Looking back on life many people regret not what they have done, but what they have left undone. They realize that they are more successful than they expected and saved less than they intended. When it comes to your financial goals and dreams, each decision and action you take will have a significant impact on your future. A good financial blueprint, rooted in your values, will lay out what you need to do today to achieve your goals tomorrow. Monica Eckberg was quoted in Joseph Couglin's article on the importance of working with a financial advisor during times of volatility in the stock market. Joseph Coughlin is the the Director of the AgeLab at MIT. 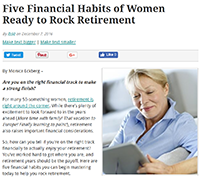 Monica Eckberg walks through the importance of having a healthy, financial routine, as one approaches retirement. Anytime is a good time to start with these essential steps. Monica Eckberg was awarded with their honor of "Top Women in Finance." In this article, she answers questions on her professional journey. Monica Eckberg was featured in the Business Journal in 2012. As an established Wealth Management Advisor, Monica's unique story and passion for her business were highlighted in this inspirational article.